At Crowell Benson Power and Water, we sell, service, and repair a wide range of Generators, from small portable inverter units through to Industrial 60kVa Power Systems. Whatever your needs, we source the best quality generator units on the market from a number of suppliers and makers to ensure we help clients meet even the toughest requirments. 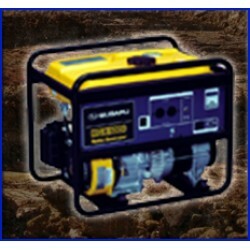 P35 - 3.5 kVa Petrol Suburu Generator Product Safety Sheets Brochu..
SUBARU RGX AVR Petrol Generators - RGX3800 Brochure Video ..
RG4300is Inverter Generator Generator Brochure - Operating Manual - P..
P53H - 5.3 kVa Petrol Powered Generator W/ Hire Pack Generator Brochure - http://www.crommelins.c..
D56E - 5.6 kVa Diesel Generator Generator Brochure Product Safety Sheets ..